Anti-Nemtsov and anti-Chubais protest in 1998. The posters say "Send Chubais and Nemtsov to justice! ", "Make soap out of Zionists"
^ a b "Борис Немцов" (in Russian). livelib.ru. Retrieved 30 April 2018. ^ a b "Петр Порошенко посмертно наградил Бориса Немцова орденом Свободы". Kommersant. 3 March 2015. ^ a b "Freedom Award Honorees". ^ Birnbaum, Michael; Branigan, William (28 February 2015). "Putin critic, Russian opposition leader Boris Nemtsov killed in Moscow". Washington Post. Retrieved 1 March 2015. ^ Zimmerman, Malia (4 March 2015). "Crossing the Kremlin: Nemtsov latest in long line of Putin critics to wind up dead" Archived 7 March 2015 at the Wayback Machine, Fox News. ^ a b Amos, Howard; Millward, David (27 February 2015). "Leading Putin critic gunned down outside Kremlin". The Telegraph. London. ^ Kramer, Andew E. (27 February 2015) "Boris Nemtsov, Putin Foe, Is Shot Dead in Shadow of Kremlin", The New York Times. ^ a b c "Борис Немцов: Боюсь того, что Путин меня убьет". Sobesednik. 10 February 2015. ^ a b c d "Russia opposition politician Boris Nemtsov shot dead". BBC News. 27 February 2015. Retrieved 30 April 2018. ^ a b c Собчак: Немцов собирался опубликовать доклад об участии российских военных в войне на Украине (in Russian). RosBalt. 28 February 2015. ^ Putin Critic Boris Nemtsov Shot Dead, NPR.org, 27 February 2015. ^ Birnbaum, Michael; Branigan, William (28 February 2015). "Putin critic, Russian opposition leader Boris Nemtsov killed in Moscow". Washington Post. Retrieved 3 March 2015. ^ Сопредседатели. Svobodanaroda (in Russian). Archived from the original on 26 February 2015. Retrieved 28 February 2015. ^ Борис Немцов [Boris Nemtsov]. Svobodanaroda. Archived from the original on 8 March 2015. Retrieved 28 February 2015. ^ a b c Schmemann, Serge (2 Mar 2015). "The Brilliant Boris Nemtsov: A Reformer Who Never Backed Down". The New York Times. ^ a b c d Ioffe, Julia (28 February 2015). "After Boris Nemtsov's Assassination, 'There Are No Longer Any Limits'". The New York Times. ^ a b c d Krichevsky, Lev (20 May 2005). "Russian Jewish Elites and Antisemitism (07 of 13)". American Jewish Committee. Archived from the original on 8 May 2009. ^ "Немцов Борис (Ефимович)". Финансовый словарь Финам. ^ "Boris Nemtsov". Moscow Times. 25 March 2011. ^ a b c d e "Profile of Boris Nemtsov: Russia's newest first deputy premier". Jamestown Foundation Prism. 18 April 1997. Archived from the original on 30 September 2007. ^ Nemtsov, B. SAO/NASA Astrophysics Data System (ADS), adsabs.harvard.edu; accessed 30 April 2018. ^ Nemtsov, Boris (1991). "Coherent mechanism of sound generation during vapor condensation" (PDF). Akusticheskii Zhurnal. 37 (5): 970–977. Bibcode:1991AkZh...37..970N. ^ Kotyusov, A. N.; Nemtsov, B. (1991). "Acoustic "laser"" (PDF). Akusticheskii Zhurnal. 37 (1): 123–29. ^ "Борис Немцов: биография убитого оппозиционера". imenno.ru. 28 February 2015. ^ a b c d Chinayeva, Elena (1996). "Boris Nemtsov, A Rising Star of the Russian Provinces". Transitions. 2 (4): 36–38. ^ Leonid Bershidsky (27 February 2015). "The Russia That Died With Boris Nemtsov". Bloomberg. ^ a b Isabella Kolar (2 March 2015). "Interview mit Boris Nemzow von 2014". Deutschland Radio. Retrieved 3 March 2015. ^ York, Geoffrey (March 1997). "From the archives: Yeltsin recruits top young reformer Nemtsov". The Globe and Mail. Retrieved 2 March 2015. ^ White, Gregory L. (28 February 2015). "Nemtsov's Career Traces Arc of Russia's Dimmed Hopes for Democracy". Wall Street Journal. Retrieved 1 March 2015. ^ a b c d e f g Shakirov, Mumin (2 Feb 2011). "Who was Mister Putin? An Interview with Boris Nemtsov". Open Democracy. Retrieved 30 April 2018. ^ Yeltsin, Boris N. (2000). Midnight Diaries. translated by Catherine A. Fitzpatrick. p. 99. ISBN 1-56511-413-2. ^ a b "Frozen Out". The Economist. 6 January 2011. ^ Peterson, D.J. (2005). Russia and the Information Revolution. Rand Corporation. ISBN 0-8330-4101-0. ^ "Boris Nemtsov: From reformist wonder boy to disgruntled opposition leader". Russia: RT. 28 February 2015. Retrieved 1 March 2015. ^ a b Smorodinskaya (ed.). Encyclopedia of Contemporary Russian. Routledge. p. 420. ISBN 1-136-78786-0. ^ Danks, Catherine (2014). Politics Russia. Routledge. p. 433. ISBN 1317867416. ^ Pronina, Lyuba (20 December 2005). "Nemtsov resigns from bank post", Moscow Times. ^ a b "Ukraine President Appoints Former Liberal Russian Lawmaker", Dow Jones International News, 14 February 2005. ^ "Ukraine Lawmakers Urge Yushchenko To Sack Russian Adviser", Dow Jones International News, 3 June 2005. ^ RIA Novosti (9 October 2006). "Ukraine President Dismisses Boris Nemtsov from Adviser Post". ^ "Nemtsov no longer presidential candidate", Pravda.ru, 26 December 2007. ^ "Russian Opposition Founds New Movement". Radio Free Europe/Radio Liberty. 14 December 2008. Retrieved 6 December 2011. ^ "Nemtsov To Run For Mayor of Sochi". Radio Free Europe/Radio Liberty. 13 March 2009. Retrieved 6 December 2011. ^ "Kremlin critic in ammonia attack". BBC News. 23 March 2009. Retrieved 26 April 2010. ^ Keating, Joshua (1 Mar 2010). "Why is a subtropical gangster's paradise hosting the next Winter Olympics?". Foreign Policy. ^ "Pro-Putin mayor elected in Sochi". BBC News. 27 April 2009. Retrieved 27 April 2009. ^ "Kremlin foes create new opposition party". Sputnik. 13 December 2010. ^ "Путин призвал не допустить во власть тех, кто "поураганил" в 90-е годы". РИА Новости. Retrieved 28 February 2015. ^ a b "Nemtsov Alleges Billions Embezzled From Sochi Olympics". Radio Free Europe: Radio Liberty. 5 March 2015. Retrieved 30 April 2018. ^ "Police arrest scores at opposition rally in Russia". The New York Times. 25 November 2007. Retrieved 1 March 2015. ^ Schwirtz, Michael (3 January 2011). "Arrests in Russia Signal Divisions Over Dissent". The New York Times. Retrieved 7 January 2011. ^ Ellen Barry (6 January 2011). "Russians React Badly to U.S. Criticism on Protests". The New York Times. Retrieved 7 January 2011. ^ Daniel Sandford (6 December 2011). "Russia election: Protesters defy rally ban in Moscow". BBC News. Retrieved 6 December 2011. ^ Shlapentokh, V. (2010). "Social Inequality in Post-communist Russia: The Attitudes of the Political Elite and the Masses (1991-1998)". Europe-Asia Studies. 51 (7): 1167. doi:10.1080/09668139998480. ^ Anna Nemtsova (26 September 2011). "To the Streets!". The Daily Beast. Retrieved 30 April 2018. ^ Garry Kasparov; Boris Nemtsov (15 March 2012). "The Right Way to Sanction Russia". Wall Street Journal. ^ Brian Whitmore (5 December 2013). "The Bolotnaya Maydan". Radio Free Europe/Radio Liberty. Retrieved 8 December 2013. 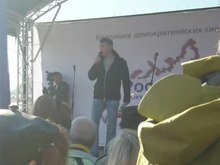 ^ Немцов рассказал, при каком условии возможно возвращение Крыма Украине [Nemtsov told under what conditions Crimea may return to Ukraine] (in Russian). Obozrevatel. 21 November 2014. ^ A Threat to National Security, putin-itogi.ru, February 2016; accessed 30 April 2018. ^ Calamur, Krishnadev (27 February 2015). "Putin Critic Boris Nemtsov Shot Dead". NPR. Retrieved 1 March 2015. ^ "Полное интервью Немцова "Собеседнику": Если бы я боялся Путина, то..." Sobesednik.ru. 27 February 2015. Retrieved 28 February 2015. ^ a b c Kramer, Andrew (28 Feb 2015). "Fear Envelops Russia After Killing of Putin Critic Boris Nemtsov". The New York Times. ^ Vasiliev, Nikita (28 February 2015). "Круглосуточная камера зафиксировала убийство Немцова" [CCTV recorded murder of Nemtsov]. TV Centre Russian: ТВ Центр (in Russian). Moscow. Retrieved 25 June 2018. ^ "Russia opposition politician Boris Nemtsov shot dead". BBC News. 27 February 2015. Retrieved 28 February 2015. ^ В квартире Немцова проводится обыск [A search is going on in Nemtsov's flat] (in Russian). Russia: RBK. 28 February 2015. Retrieved 28 February 2015. ^ "After Boris Nemtsov's Assassination, 'There Are No Longer Any Limits'". Retrieved 2018-11-01. ^ "Report blames Chechen leader over killing of Kremlin critic". Yahoo! News. 23 February 2016. Archived from the original on 25 August 2016. Retrieved 2 August 2016. ^ "Russia: Five men stand trial for Boris Nemtsov murder". www.aljazeera.com. Retrieved 11 February 2017. ^ "Nemtsov killer sentenced to 20 yrs. behind bars, accomplices to 11–19 yrs". RT International. 13 July 2017. Retrieved 13 July 2017. ^ "5 guilty in Nemtsov murder trial, 'mastermind' still at large". RT International. 29 June 2017. Retrieved 13 July 2017. ^ Tanas, Olga & Jason Corcoran (27 February 2015). "Thousands March for Russia Opposition After Nemtsov Murdered". Bloomberg. Retrieved 30 April 2018. ^ "Boris Nemtsov murder: Tens of thousands march in Moscow". BBC. 27 February 2015. Retrieved 30 April 2018. ^ a b c "Reaction to death of Boris Nemtsov". BBC News. Retrieved 26 December 2015. ^ "The Observer view on the death of Boris Nemtsov". The Guardian. 28 Feb 2015. ^ "Putin vows to punish killers of Kremlin critic, as opposition condemns 'political murder'". The Journal. February 2015. Retrieved 26 December 2015. ^ "Boris Nemtsov allies fear killers of Russian politician will escape justice". The Guardian. 28 February 2015. Retrieved 26 December 2015. ^ "Poland awards daughter of slain Russian opposition leader Boris Nemtsov". Fox News. 4 August 2015. Archived from the original on 24 September 2015. Retrieved 6 August 2015. ^ "Russian Activists Dedicate Monument To Slain Boris Nemtsov". RadioFreeEurope/RadioLiberty. 2015-09-10. Retrieved 2015-11-03. ^ "Власти Нижнего Новгорода согласовали марш памяти Бориса Немцова". Радио Свобода (in Russian). Retrieved 11 February 2017. ^ "Public Hearing Notice" (PDF). lims.dccouncil.us. ^ "B22-0539 – Boris Nemtsov Plaza Designation Act of 2017". lims.dccouncil.us. ^ CNN, Maegan Vazquez,. "DC street in front of Russian embassy renamed to honor Putin critic". ^ "House passes series of measures hitting Russia, Putin". thehill.com. ^ Указ Президента РФ от 10 марта 1995 г. N 260 "О награждении медалью ордена "За заслуги перед Отечеством" II степени"
^ Депутаты Госдумы получили к празднику медали и погоны (in Russian). 23 February 2001. Retrieved 28 February 2015. ^ "Boris Nemtsov". severleg.cwx.ru. 5 April 2009. Retrieved 28 February 2015. ^ "Чем запомнился Борис Немцов?". aif.ru. 28 February 2015. ^ "Валерий Шанцев, Евгений Люлин, Борис Немцов, Евгений Крестьянинов, Владимир Иванов и Дмитрий Бедняков будут награждены почетным знаком Заксобрания Нижегородской области "За заслуги"". niann.ru. 26 March 2009. Retrieved 28 February 2015. ^ "Указ Президента Украины No 698/2006". president.gov.ua. Archived from the original on 8 August 2014. Retrieved 28 February 2015. ^ "Żanna Niemcowa: mój ojciec oddał życie za wolną Rosję" (in Polish). TVN24. 15 May 2015. Retrieved 15 May 2015. ^ "Борису Немцову посмертно присуждена "Премия свободы" в США". BBC. 10 September 2015. ^ "IRI to Honor Speaker Boehner, Mo Ibrahim & Boris Nemtsov with 2015 Freedom Award". International Republican Institute. ^ Putin: What 10 Years of Putin Have Brought 2010. Translated into English. 0Создание сайта: Павел Елизаров. ^ "The Nemtsov White Paper, Part V – Putin the Thief". La Russophobe. 3 April 2011. ^ "Путин. Война – Открытая Россия". Openrussia.org. Retrieved 2018-04-30. ^ "Nemtsov Report Details Human and Financial Costs of War in Ukraine", Moscow Times, 12 May 2015. ^ Kramer, Andrew E. (12 May 2015). "Kremlin Critic's Posthumous Report Links Russian Soldiers to Ukraine". The New York Times. 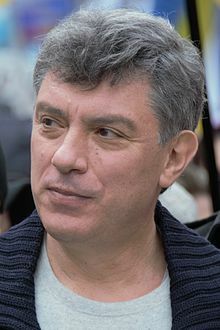 Wikimedia Commons has media related to Boris Nemtsov. Bolshoy Moskvoretsky Bridge is a concrete arch bridge that spans the Moskva River in Moscow, Russia, immediately east of the Moscow Kremlin. The bridge connects Red Square with Bolshaya Ordynka street in Zamoskvorechye. Built in 1936-1937, it was designed by V. S. Kirillov and Alexey Shchusev. Vladimir Putin has served three terms and is currently in a fourth as President of Russia and was Acting President from 1999 to 2000, succeeding Boris Yeltsin after Yeltsin's resignation. Putin was also Prime Minister for three months in 1999 and served a full term from 2008 to 2012. During Putin's presidency, he has been a member of the Unity party and the United Russia party. He is also affiliated with the People’s Front, a group of supporters that Putin organized in 2011 to help improve the public's perception of United Russia. His political ideology, priorities and policies are sometimes referred to as Putinism. Opposition to President Vladimir Putin in Russia can be divided between the parliamentary opposition parties in the State Duma and the various non-systemic opposition organizations. While the former are largely viewed as being more or less loyal to the government and Putin, the latter oppose the government and are mostly unrepresented in government bodies. Major political parties considered to be part of the non-systemic opposition include Yabloko and the People's Freedom Party, along with the unregistered Progress Party. 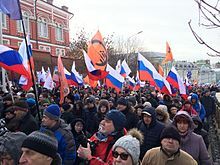 Other notable opposition groups included the Russian Opposition Coordination Council (2012–13) and The Other Russia (2006–11), as well as various non-governmental organizations (NGOs). The assassination of Boris Nemtsov, a Russian politician opposed to the government of Vladimir Putin, happened in central Moscow on Bolshoy Moskvoretsky Bridge at 23:31 local time on 27 February 2015. An unknown assailant fired seven or eight shots from a Makarov pistol; four of them hit Boris Nemtsov in the head, heart, liver and stomach, killing him almost instantly. He died hours after appealing to the public to support a march against Russia's war in Ukraine. Nemtsov's Ukrainian partner Anna Duritskaya survived the attack as its sole eyewitness. Confessions of a rebel. Politics without whoring is a book by Russian politician Boris Nemtsov, published in 2007 in Moscow publishing house Partisan, in which he describes some of the political events of the 1990s, the beginning of his political career, presents his views on the problems of Russian society. Nemtsov, in particular, regrets that the SPS support Vladimir Putin's candidacy in the presidential elections in 2000. This is the third in his series of autobiografic books: Provincial (1997), Provincial in Moscow (1999) and Confession of a rebel (2007). Leonid Martynyuk is a Russian opposition author, video producer and journalist. Trump: The Kremlin Candidate? 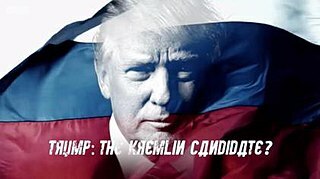 is a documentary film first broadcast by the program Panorama on BBC One, examining links between Trump associates and Russian officials and the relationship between Vladimir Putin and Donald Trump. It features investigative journalist John Sweeney, who journeyed to Russia, Ukraine, Lithuania, and the United States during the course of his research. The documentary first aired in the United Kingdom on 16 January 2017, four days before the Inauguration of Donald Trump. Sweeney had prior experience on the subject matter, having interviewed Trump in 2013, and Putin in 2014. The film was directed by Matthew Hill, Tomiko Newson, and Nick Sturdee.